The drawing cut is actuated by a two-hand push-button control at the right or at the left-hand side adjacent to the area of cut. Included in the delivery is a safety-orientated electric control system, a plexiglass-guard and plug-in type angular stops. On request we also deliver work tables of greater lengths with intermediate supports and length stops. 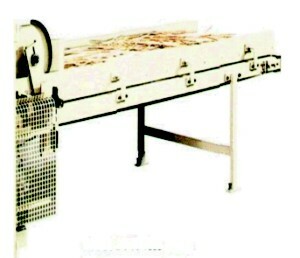 The FAZ 100 is a low-noise chopping machine for waste veneer strips and veneer pack trimmings. Veneer scrap produced in the course of cutting veneer to size can be put to profitable use as a heating fuel. Conventional rotary refuse grinders are unsuitable, for the chopping of veneer (high level of noise, veneer strips become tangled.) Machine loading and unloading can be adapted to the specific conditions of production. A vacuum extractor unit can be installed on the slide. Chopping reduces the volume of waste by half, i.e. chopped veneer waste needs about 50% less space for transporting and storage. It is an advantage to use a long feed conveyor to collect the veneer waste from several cutting machines. 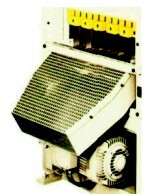 The chopping machine’s conveyor can be lowered on request to enable nearfloorlevel feeding.